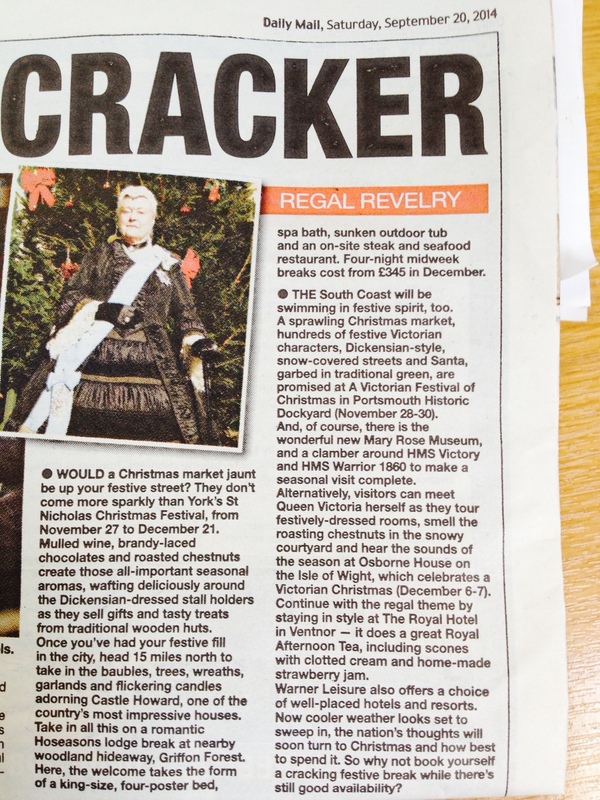 This week, we have been picked up by two national newspapers as a result of our efforts; firstly the Daily Mail which featured Osborne’s Victorian Christmas for their Festive Breaks feature and secondly, the Daily Express which included the October Walking Weekend in their “Get Packing” round-up. The Daily Mail is now looking for Festive Craft Breaks and Courses in the UK. These need to run over a weekend from November onwards and include activities such as making cards, wreaths, festive flowers, making gifts, decorations, baubles, festive cooking etc. The emphasis is on the craft element and needs to include these skills rather than just seeing/buying crafts at a Christmas market etc. If the course is not residential and does not offer accommodation, we will need to recommend nearby accommodation. The deadline for submissions is 4.30pm on the 6th October. Please e-mail holly@visitwight.org if you have anything relevant. This week, Visit Isle of Wight (VIOW) will welcome a delegation of around 40 of Great Yarmouth’s tourism and business elite to the Island, as part of a tourism fact-finding mission. The visit is an “exchange of ideas” exercise with their counterparts to learn how they deal with the many issues that arise within tourism. During the 3-day trip (30 September to 2nd October), the group will be able to get a first-hand look at some of our attractions including Godshill Model Village, Blackgang Chine, The Needles Park and Seaview Wildlife Encounter. The press team also continues to support journalists in planning itineraries and this week, Erik Brusten, one of the leading freelance travel journalists in Belgium, is exploring the Island covering everything from fossil hunting and fish restaurants to historic sites including an accompanied “Hendrix in the West Wight” walk. Next month, we will be hosting Helen Werin, the travel editor of Motorcaravan Motorhome Monthly who is on the Island to prepare a six page feature in MMM for next May or June. Thanks to all those who continue to work with us and host these visits.